Cowl season is right around the corner! Penelope by the Berroco Design Team calls for 4 balls (2 balls MC, 1 ball C1, 1 ball C 2) of Ultra Wool DK, a soft, easy care yarn that is a pleasure to work with. It's such a pretty pattern! It's a simple customizable lace pattern that is fun to make. 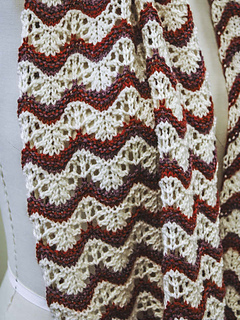 It's a great project if you're interested in learning to knit lace.